1. A tsunami is is a wave train, or series of waves. 2. It is generated in a body of water by a disturbance that vertically displaces the water column. 3. Earthquakes, landslides, volcanic eruptions and explosions, can generate tsunamis. 4. Tsunamis can savagely attack coastlines, causing devastating property damage and loss of life. How do EARTHQUAKES form TSUNAMIS? Tsunamis can be generated when the sea floor abruptly deforms and vertically displaces the overlying water. Tectonic earthquakes are a particular kind of earthquake that are associated with the earth's crustal deformation. When these earthquakes occur beneath the sea, the water above the deformed area is displaced from its equilibrium position. Waves are formed as the displaced water mass attempts to regain its equilibrium. When large areas of the sea floor elevate or subside, a tsunami is created. 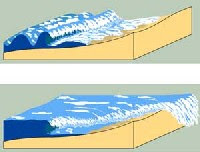 A tsunami travels at a speed that is related to the water depth - hence, as the water depth decreases, the tsunami slows. The tsunami's energy flux, which is dependent on both its wave speed and wave height, remains nearly constant. Consequently, as the tsunami's speed diminishes as it travels into shallower water, its height grows. Thus, due to this shoaling effect, a tsunami, imperceptible at sea, may grow to be several meters or more in height near the coast and is highly destructive.